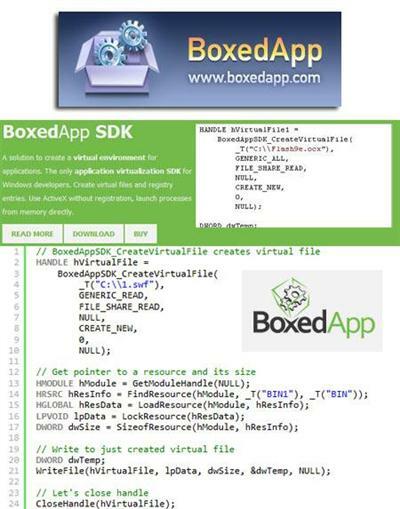 BoxedApp SDK is a developer library that provides a set of functions for emulating a file system and a system registry for an application. Using these functions, you can create virtual files, fake registry entries, keys and values. You can launch processes from memory directly, use ActiveX without registration, embed runtimes like .Net, Flash and VC++ redistributable. Supports both x86 and x64 platforms. Samples for C++, Delphi, VB6, C#, VB.Net are available. Just a quick example: suppose, your application uses a Flash ActiveX player to display a Flash movie or video. The end users would need a Flash player ActiveX to allow your application work properly. Also, keep in mind that Flash player is not capable of loading files directly from memory. That exposes two major problems: first, you would have to install a Flash player ActiveX, and second, you would have to have the movie in a file. BoxedApp SDK solves these problems: you simply create a virtual file that contains the flash movie, another virtual file that contains the Flash player ActiveX DLL, and virtual registry entries that point to that virtual file. That's it. Now the application "thinks" that that the Flash player ActiveX is actually installed, so the Flash player works just as if the movie file was actually there. BoxedAppSDK 3.3.5.0 x86x64 Fast Download via Rapidshare Hotfile Fileserve Filesonic Megaupload, BoxedAppSDK 3.3.5.0 x86x64 Torrents and Emule Download or anything related.